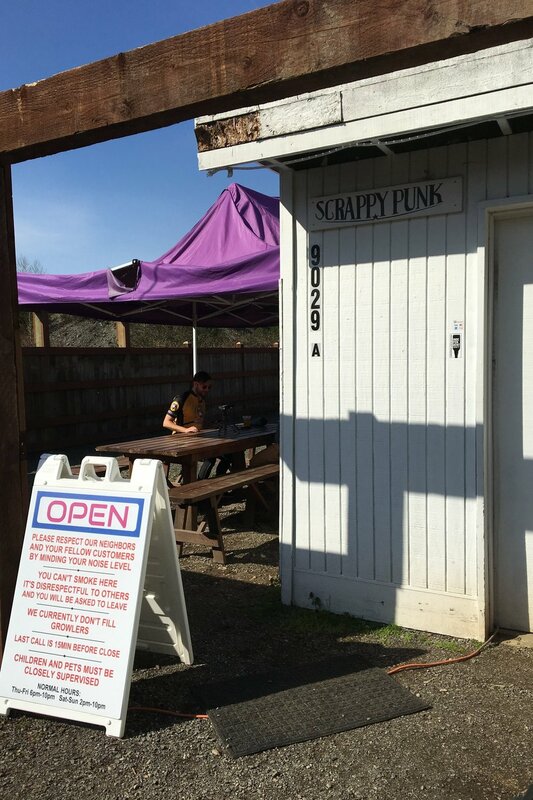 This week the Cycling Cicerone visits Scrappy Punk Brewery in Snohomish. Snohomish is a little town near Everett, Washington with a lively brewery scene all easily accessible by bike. You may remember them from the bike route map I made a while back for their little town. Scrappy Punk is a well suited name for such a small brewery. Its 3 barrel system isn't the smallest I've seen, but the garage Greg, the Scrappy Punk himself, brews out of is no bigger than a one car garage, and in fact, basically is one. In this episode Greg tells his tale of what it took for him to become a brewer, some of the huge hurdles he's jumped along the way, and gives a warning to anyone else bold enough to follow in his footsteps. This is the whole thing! Right around the corner is a bathroom, and that is it! Local drinking heroes, Jim and Nancy, are at the bar. Y'all are famous now! Scrappy punk has perfect patio for some day drinking. Canopy donated by Jim and Nancy, local legends.